Provides compliance to BAL bush fire ember attack requirements in accordance with AS3959 by providing a secondary form of ember protection for the roof space - roof sarking is mandatory under the Building Code of Australia (BCA) for all tiled residential roofs, regardless of roof pitch, with a rafter length greater than 6 metres. Roof sarking also protects the building structure from the weather prior to the application of the roof, which can limit water damage to internal structural components and improve on-site work flow efficiency by allowing some internal trades to commence work before the roof is applied. 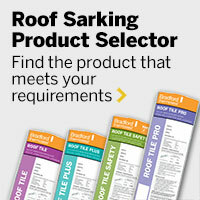 For additional information on roof sarking, please visit the Roof Sarking pages. A range of reflective foil insulation products which, when combined with Bradford Gold Insulation, can improve thermal comfort by reducing radiant heat transfer entering your home. Energy efficient, innovative home ventilation for comfortable living. Brought to you by CSR Edmonds.